Yes, we have many contractor testimonials and reviews to offer. And we have many contracting services such as Bathroom Remodeling and Kitchen Remodeling. So let us tell you a little about our local rich history so you too can see why we want to be your Junction City Remodeling Contractor. Before Jen and Forrest were officially dating, the two of them along with a small group of friends decided that they were all going to go up to Junction City, Oregon to Lone Pine Farms one evening to go through the haunted corn maze. As it started getting dark they all left Eugene to head up to Junction City. About 30 minutes later they arrived at Lone Pine Farms and it was busy, the haunted corn maze was the thing to be doing that night. It took them some time to get to the front of the long line, but the wait was worth it! Lone Pine Farms in Junction City is such a sweet place. They have a pumpkin patch, fresh fruits and vegetables for sale, tasty treats, and farm animals to visit. There is plenty to do, and it’s completely family friendly. With all that in mind, how bad can a haunted corn maze be? Terrifying, and a bit more than the advertised family friendly hour! So off they went through the corn maze, all fun and games until monsters with masks start jumping out of the corn, strobe lights flashing, noises coming from the corn field and men with scary sounding chainsaws sneaking up revving the engines. Everyone was having fun being scared except Jen who realized pretty quickly that she didn’t much like being scared. About half way through the corn maze, Jen was holding Forrest hand so tight (which by the way she was trying to hide from their friends). Suddenly a man with mask and chain saw came barreling out of the porta-potty on the other side of the path headed straight for Jen! She was so terrified she tripped over her own feet trying to get away falling down in the mud and since she was holding Forrest hand, dragging him down on top of her. Not only were they covered in mud, but everyone knew that we were holding hands. I guess after that night in Junction City, you could say they had their first date! On top is a New Kitchen from remodeling work with did for one of your neighbors. 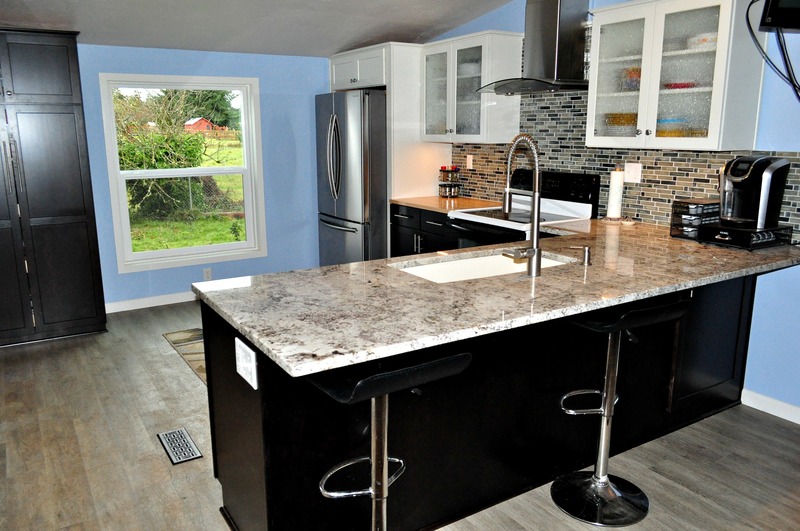 Learn more about this Junction City Kitchen Remodeling job here. Castile Construction, Inc. services the town of Junction City as well as the surrounding area, and the zip code 97448. Learn more about Junction City here. We’d love to have the opportunity to work for you and become your Junction City contractor of choice. But please we will take no form of payment in terms of another trip through the haunted corn maze. We hope to beautify Junction City, Oregon, one home one at a time. Castile Construction is Certified in Universal Design through the National Association of Remodelers (NARI). This furthers our commitment to helping design your Remodel vision to completion. Contact Castile Construction today to discuss us becoming your Junction City Remodeling Contractor. We welcome the opportunity to meet and work with our neighbors.